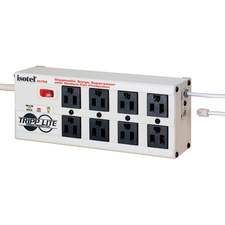 ISOTEL8ULTRA offers 8 outlets arranged in four filter banks to prevent system crashes, reboots and performance problems common as noisy system peripherals are powered off and on. 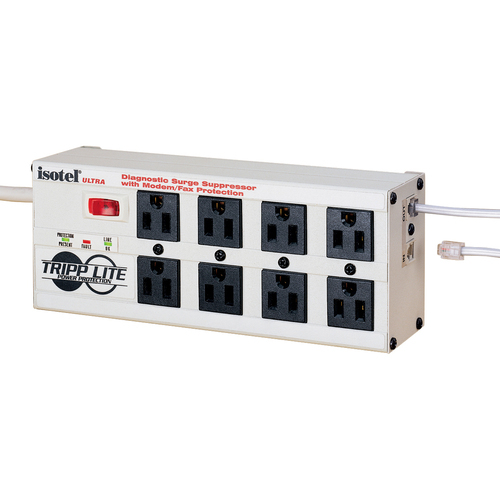 Surge suppression rated at 3840 joules/92,000 amps offers network-grade protection. Widely spaced NEMA 5-15 outlets accommodate up to 4 large transformer plugs without blocking outlets. Pair of RJ11 jacks offer single phone line surge suppression for modems, fax machines and cordless phones. Diagnostic LEDs confirm power availability, line fault and protection status. 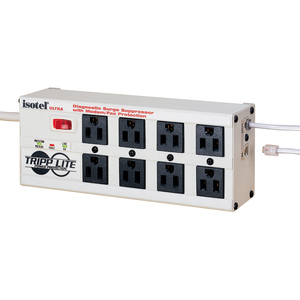 Includes 12 foot AC line cord with space-saving angled input plug, keyhole mounting tabs and a set of 4 child safety covers.